I am a rising senior at the University of Mary Washington and I’m majoring in biology. I started working with Friends of the Rappahannock (FOR) this summer because I’ve always had an interest in wildlife and the environment and a passion for conserving it. This summer I have been helping FOR with restoration projects and outreach events. 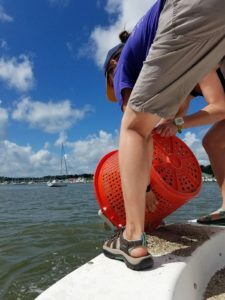 I recently went on an oyster restoration trip to Urbanna, Va., along with other interns and volunteers. FOR collects oyster shells from local seafood restaurants including The Confident Rabbit in Fredericksburg. 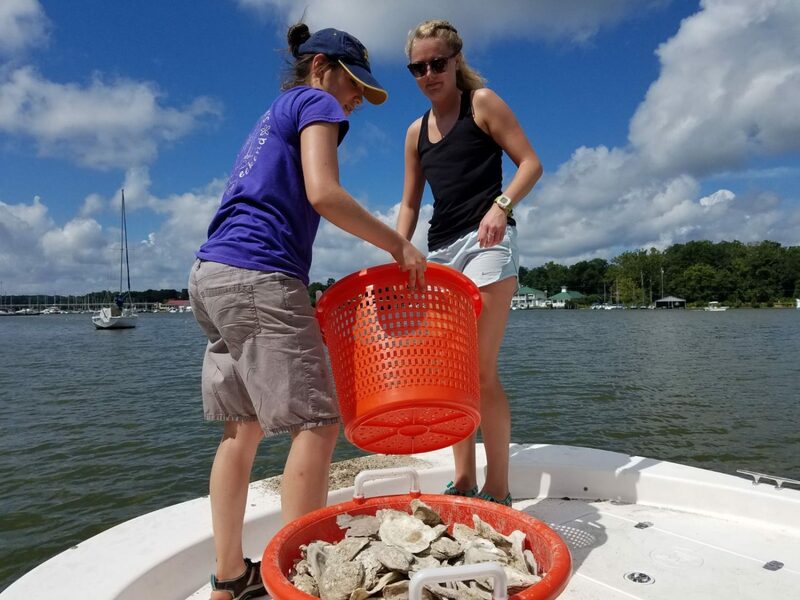 We took a boat out and dumped several bushels of oyster shell into the river to help restore oyster reefs, which is important because just one oyster can filter up to 50 gallons of water each day. After some hard and important work, we got to enjoy the rest of the afternoon on the water. We got to see some scenic sights of the river and some interesting wildlife. Afterwards, we went to Urbanna Seafood and Raw Bar to wrap up the day and enjoyed local soft shell crabs, oysters, and shrimp! Working with Friends of the Rappahannock this summer has given me valuable experience and knowledge. I got to work alongside people with similar goals and passions and got to see what FOR’s work is all about. It was very rewarding to be able to help the Rappahannock river this summer, whether it be by restoration, education, or advocacy. FOR volunteer Kay Pontarelli (VT ’20) dumps oyster shells during a work day in Urbanna Creek. My name is Katherine Pontarelli and I attend Virginia Tech where I’m majoring in Systems Biology and Physics, with minors in Mathematics and Biophysics. I’ve volunteered with FOR this summer by helping with restoration projects and FOR’s Life Along the Rappahannock oral history program. For Life Along the Rappahannock, I focused on transcribing an interview done by Woodie Walker with King George County resident James Pitts Sr. I couldn’t believe Mr. Pitts was 97 years old at the time! His memory recalling his childhood along the Rappahannock River was lightning fast and incredibly descriptive. He mentions catching shad and herring with the ebb tide, boats coming through Colonial Beach, and catching 17 dozen bullfrogs! The Rappahannock was an important provider for Mr. Pitts and his family. He said that he and his family would have gone hungry if it weren’t for the Rappahannock River. I hope more volunteers will show up in conservation agencies like FOR, to continue taking care of and to enjoy our environment, especially because river systems are such an essential resource to humankind. I plan to be back next summer!